During most of the game versus the UP Fighting Maroons last October 10, Wednesday, the UST Growling Tigers could be seen utilizing a 2-2-1 press during inbound situations. This isn’t anything new, especially with an Aldin Ayo-coached team. 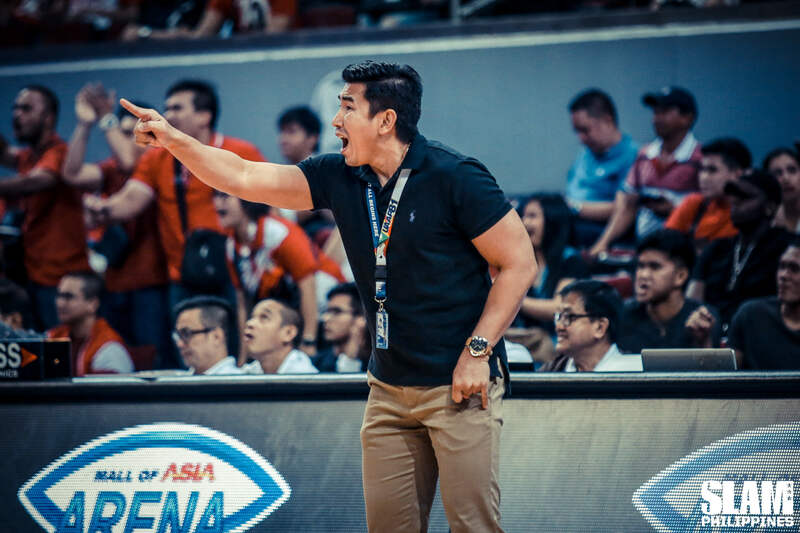 After all, “Mayhem” was the word we often related to Coach Aldin Ayo. Basketball fans already had a pre-conceived notion of what his system is. “Puro trap!” said CJ Cansino on what he believed Mayhem to be before he was handled by Ayo. Ayo’s Letran team of 2015 was the best example of this, utilizing sneaky versatility along with pesky quickness to pressure teams into turnovers. La Salle, on the other hand, bullied teams with their size and athleticism. The Growling Tigers of Season 81 resembled that Letran squad, so it wouldn’t have been surprising if they used multiple traps to turn turnovers into easy baskets. This 2-2-1 formation they had versus UP was perfect for such. Surprisingly, as the Fighting Maroons inbounded the ball, UST didn’t send out any traps. The guards at the top of the 2-2-1 pressured, but they didn’t bother to double, or even force turnovers. Just the right amount of pressure. It may look pointless on the surface, but in reality, this was with purpose. The use of the 2-2-1 was to delay the halfcourt, ball-screen heavy action of the Fighting Maroons. The Growling Tigers led by as much as 30 in the game, ultimately winning 86-72, so it’s safe to say the defensive scheme worked. Is Mayhem dead? It’s easy to say yes because of UST’s lack of trapping, but the reality is, it isn’t. It’s difficult to get a complete grasp of what Coach Ayo means by “unpredictable”. The model of an Ayo-led team is generally simple. He prefers quick guards (Renzo Subido, Aljun Melecio, Mark Cruz), a good forward (CJ Cansino, Ricci Rivero, Kevin Racal), while the rest can take care of themselves. But if we were to provide a hypothesis to what makes Mayhem unpredictable, it can be summed up with one word: versatility. There are three particular players in UST’s team that showcase this the best. It all starts with Subido and Marvin Lee, the polarizing backcourt duo of Coach Aldin Ayo. Both players have been met with plenty of criticism over the course of the season. In their first game versus the NU Bulldogs, they combined for an 8/43 shooting clip, meaning they missed a total of thirty five shots. That’s a total an entire team could have, but this was just between TWO players. Since then, they’ve been on and off, and people have continued to rile on them whenever they struggle. This was especially evident during the losses of UST versus Ateneo and La Salle, as Subido, Lee, and the rest of the Tigers failed to make an impact. It was understandably frustrating for UST fans to watch. The team itself was frustrated. But that didn’t mean they didn’t know what the reason was for their struggles. “Our problem was that, we didn’t know our roles individually,” said Subido. This was a reasonable take. During those two losses, the offense looked jumbled up, and their defense could not shut down whatever Ateneo and La Salle threw at them. But since then, they’ve adjusted, and have had clearer definitions of what they’re supposed to do. Subido has been a point guard all his life, and with Coach Ayo, it hasn’t been much different. For most of the season, he’s been the one tasked to bring the ball down to set things up for his teammates. It’s easy to paint this as Ayo using Subido as his Mark Cruz, a high volume shooter that controls the offense. That isn’t entirely the case. “Everyone can bring down the ball,” said Subido. In fact, Subido hasn’t been at his best when shooting off the dribble. What he’s been best at, is moving off screens and scoring off the catch. It’s an underrated part of how Coach Ayo handles his players. As volume of a scorer that Mark Cruz was, a large part of his success was how he used the movement that was employed by Mayhem. Unpredictability. He used this to his advantage. Subido’s done a lot of the same. Slowly but surely, Subido started to flourish with the Growling Tigers. He leads the team in scoring with 15.9 points per game. The transition hasn’t been as easy for Lee, however, who’s shot just 24.6% from beyond the arc. It’s been tricky for him. His size tells him to play the point guard position, while his skill set screams two guard. He’s looked hesitant at times, and it’s affected his play. But Lee said, Coach Ayo has been preaching the same thing again and again to his players, even when they were getting blown out of the water. “Sandalan lang namin yung sistema, magtiwala lang kami, lalabas din yung laro namin,” said Lee. Lee is starting to figure out a role within the team. He’s had some opportunities to handle the rock, but for the most part, he’s committed himself to moving off the ball. For instance, during the chances that he initiate the offense, when he gives up the ball, he immediately moves for scoring position. It’s a trick that’s difficult to grasp, especially as someone setting things up, but when done correctly, it can pay off dividends. Lee’s starting to figure things out. Even with the two veteran guards holding the back court, the player who’s been talked about the most is the rookie, Cansino. He was a highly touted recruit, having won MVP in the UAAP Juniors Division, but no one expected him to be this good, this early. His strong frame and athleticism are often talked about, but underrated with Cansino was his hard work. With the Tiger Cubs, if there was one caveat with Cansino’s game, it was his defense. He always had the physical tools to be an elite 3DA type of wing, but his motor was never consistent. He’d get his points and rebounds, but the little things that coaches love weren’t exactly his cup of tea. He won MVP in the Juniors Division, that was nice. But Cansino himself knew he had to do more. “Expected ko na pag-akyat ko nung college, defense,” mentioned Cansino. Especially with Coach Ayo, players who couldn’t play defense was a huge no no. It wasn’t even a matter of skill. Defense, as they say, starts with effort and giving a damn. In theory, it sounds easy to do. Flip the switch as they say. But Cansino had to adjust, knowing that as a rookie, the Growling Tigers wouldn’t be his team. From the get go, it looks like he’s embraced the challenge. Even though he hasn’t been getting the same amount of shots as he did in high school, he’s worked on doing other things to contribute to the team. The most glaring thing: his rebounding. He averages 9.4 rebounds, an incredibly high number for a guard, what more a rookie. While his frame is still rather thin, he uses athleticism, elite feel for the game and IQ to grab boards. His effort has been impeccable, especially on offensive rebounds where he averages 3.1 per game. And these rebounds haven’t gone for naught. His teammates have rewarded him for his efforts, giving him good looks off these second chance opportunities. By giving the team a second chance, he allows his teammates to also give him the platform to do what he does best: score. On defense, it isn’t easy to see his growth because his steal and block numbers don’t pop out, but he has been quite the stud. He still isn’t an elite one on one defender, but as a help defender, he’s close to achieving that status. He averages just 1.6 fouls per game, an impressive stat considering the amount of times he swipes at balls whenever he helps on drives. He’s been aggressive in using his physical gifts, but he’s made sure to remain smart. 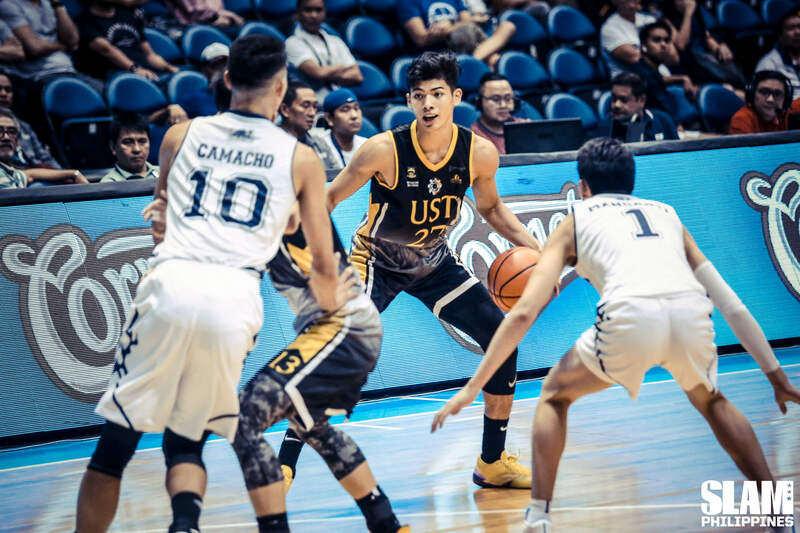 It’s easy to paint Cansino as the main man of UST, but that isn’t true. That would be disrespect to the system,of Coach Ayo. “Di naman ako talaga yung main man,” said Cansino. “Lahat equal opportunities.” He’s only averaging 10.9 field goal attempts per game, just third in the team, but his efficiency has been impeccable. Splits of 43-45-78 are not to be scoffed at, especially for a rookie. 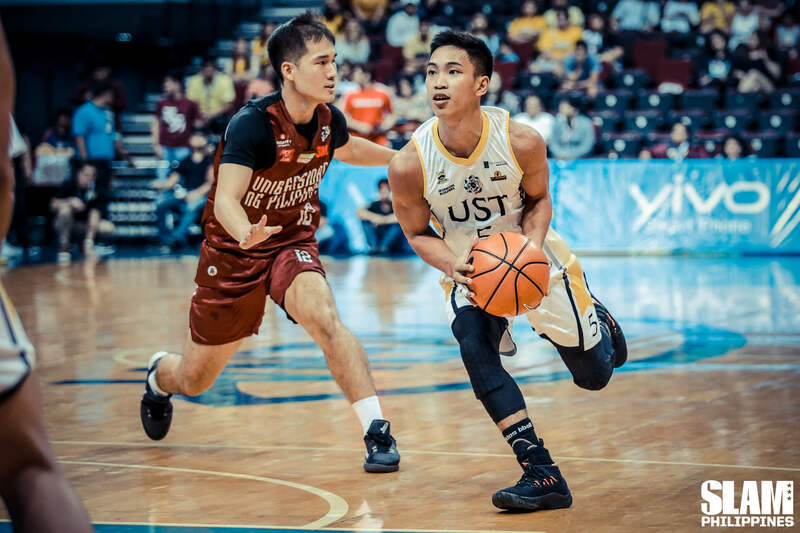 As the season rolls on, UST will still continue to use different type of press setups, while the idea of Mayhem continue to roll discussions surrounding their squad. But as they play, they’re also redefining to the public what Mayhem truly is. “It’s not only for defense,” said Coach Ayo. “It’s also for offense. It’s the entire system.” As Ayo has said so himself, at its very core, it’s unpredictability. Next time, don’t be surprised if they use the same 2-2-1 press formation they threw versus UP. Maybe they continue to delay half court attacks. Or maybe they actually trap, just because it best fits how the opponent plays. No one knows. Mayhem isn’t rigid. It’s unpredictable. It’s a system that’s meant to surprise, just like how the Growling Tigers have surprised the UAAP this Season 81.